Hello! It's time for a brand new Mojo Monday sketch (#233). Teresa has created another great sketch for us to play with! I used Amazing Wishes for my sentiment today (it's currently on sale!). I also added a cluster of blooms (all patterned paper, except for the top one - felt) which were all cut using the fun Loopy Blooms Die Set! Accessories: A Cut Above Dies: Loopy Blooms Die Set (Verve), Small Scallop Border Die (Papertrey Ink), Crystals, Rose (Prima); Felt, Ribbon (May Arts), Foam tape, Thread, Sewing machine. Beautiful, Steph! Love the cluster of flowers and the distressing! Oh my goodness your cards are always so beautiful! this is awesome, gorgeous card...have a super week! Beautiful card Stephanie! 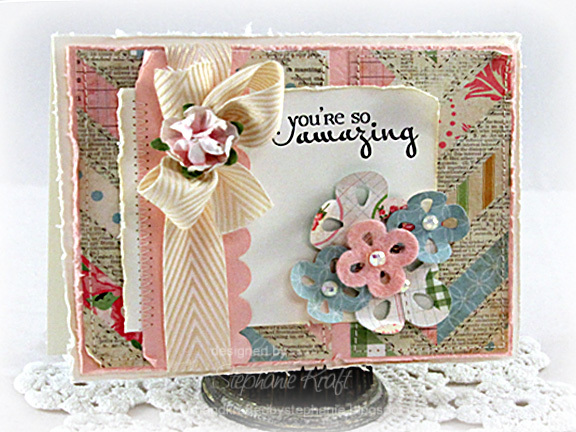 Those little die cut flowers are so pretty and love the patterned paper you used! Thanks for the inspiration! Oh your card is Gorgeous!!! love it all! What a pretty card! I like your shabby chic take on the sketch. I seriously need to use those loopy blooms more!!! Fabulous card!!! I love the tattered look to the card. It's so feminine and yet shabby. Nice!